lock screen pattern photo love, very nice and smooth. 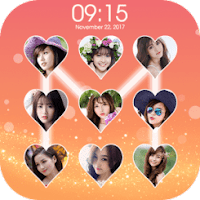 lock screen by pattern with photo in heart. This lock screen app has a beautiful lock screen with many photos. This application protects your phone with pattern (password). lock screen very high security, nice and smooth. This lock screen photo have features: lock screen, Create image for button from your gallery, and turn off screen by shortcut. It's a perfect lock screen on Play store.